If you see a Microsoft Windows® activation prompt saying that your copy of the Windows OS is not genuine, it might be true that it is shown by Sharecash Screenlocker, and you do not need to purchase the activation key. According to specialists working at pcthreat.com, Sharecash Screenlocker is nothing more than a Trojan infection, so it should not be very surprising that it has appeared on the computer without permission. Even though this threat tends to slither onto computers rather secretly, it does not try to hide itself on the computer, so it starts working right after it successfully infiltrates the system. In other words, the fake window saying “This copy of Microsoft Windows® is not genuine” will be opened in the place of Desktop. This window could not be closed, and, as research carried out by our specialists has shown, it will not disappear from the screen after the system reboot because of the changes Sharecash Screenlocker applies to the system registry immediately after it enters the computer. Do not worry; we know a way to remove this fake window from your Desktop, so you should read this article and then eliminate it as soon as possible because this fake activation window will not allow you to use your PC normally. It might really seem that the activation window shown by Sharecash Screenlocker is genuine; however, we can assure you that it is not true, and all you have to do is to delete malware. Unfortunately, many users find this article after clicking on buttons available on this fake window. If users click on Click here to get your key, a small window with a Download button is opened. Even though users see “Your file is ready…”, the automatic download of software will not start. Instead, you might be asked to complete a survey if you click on the Download button you see. Do not take this survey because it will, most probably, ask you to enter personal details and then might sell this information to different companies or even cyber criminals. 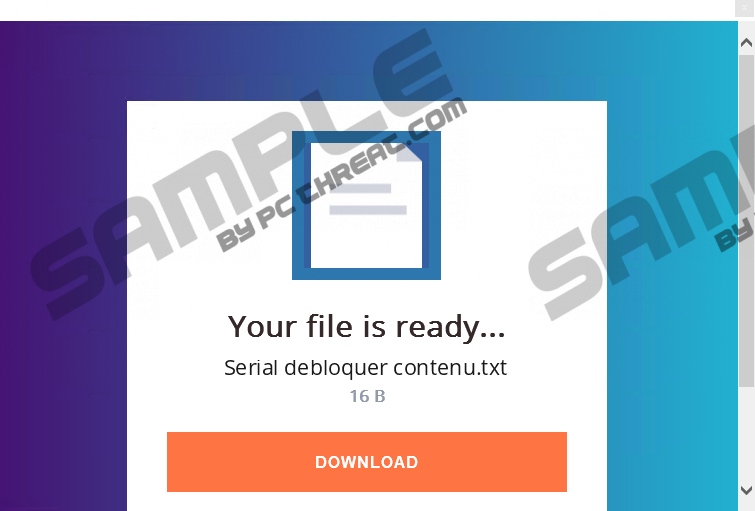 Even though the survey should unlock the download, you should hurry to remove Sharecash Screenlocker instead of taking the survey because it has been found that software will be downloaded from fileam.com, which cannot be called the most trustworthy website, after unlocking the download. Let’s talk about the entrance of this threat before its deletion. It has been found that Sharecash Screenlocker enters computers without permission in most cases. It is usually distributed through spam emails, i.e. it travels as an attachment there or cyber criminals might send bad links to users, but it might come inside bad downloaders as well. Either way, it illegally enters computers. Once it is inside the system, it places its executable file in C:\Users\user\AppData\Roaming. In addition, it creates a Value in the Run registry key (HKEY_CURRENT_USER\SOFTWARE\Microsoft\Windows\CurrentVersion\Run), so that it could kill the process of the Windows Explorer and place the fake Windows activation window on Desktop again. To make Sharecash Screenlocker gone forever, you will have to fully remove this malicious application. Unfortunately, it does not mean that it is impossible to encounter a similar infection in the future after the removal of Sharecash Screenlocker, so you should take all the measures to protect your computer from harm. Security specialists say that users who wish to protect their computers from harm should stay away from questionable third-party websites and do not download freeware from these pages. Secondly, users should ignore the spam mail folder completely. Last but not least, users should not click on ads that appear on the screen. Finally, a reputable antimalware application should be installed on every system. Enable it and keep it this way to protect your computer from future threats. The first thing you will have to do if you decide to remove Sharecash Screenlocker manually is to launch the explorer.exe process killed by this malicious application. Then, the executable file belonging to this threat has to be detected and erased. Finally, the Value of Sharecash Screenlocker has to be eliminated from the Run registry key. Use our instructions if you have never deleted malware before, or scan your computer with a reputable malware remover, e.g. SpyHunter. You could download it after you launch the killed process of Windows Explorer. Click File and then select New Task from the drop-down menu. Enter explorer.exe and click OK. Enter C:\Users\user\AppData\Roaming at the top of the Windows Explorer. Find and delete the svtres.exe file. Type regedit.exe and click OK to launch the Registry Editor. Right-click on the Value Adobe with the Value data C:\Users\user\AppData\Roaming\svtres.exe and select Delete. Quick & tested solution for Sharecash Screenlocker removal.